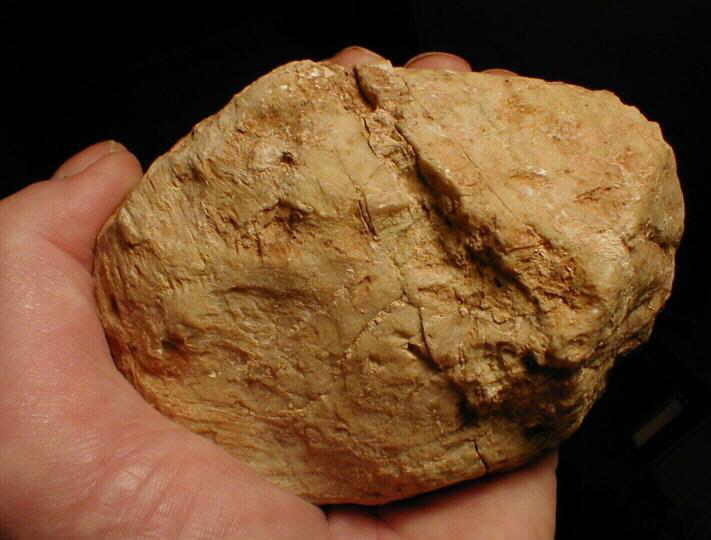 Impact ejecta: front and rear side of a typically deformed limestone boulder. Coin diameter 25 mm. 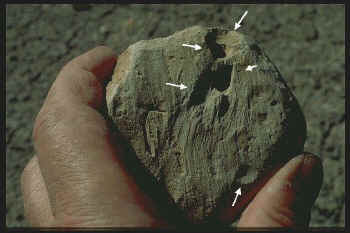 Puerto Mínguez impact ejecta: limestone component showing heavy striations and deep imprints (arrows). The prominent imprints point to strong plastic deformation upon high-pressure contact with other components. 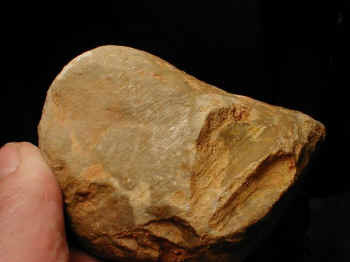 Puerto Mínguez impact ejecta: limestone component displaying extremely fine striations and mirror polish. 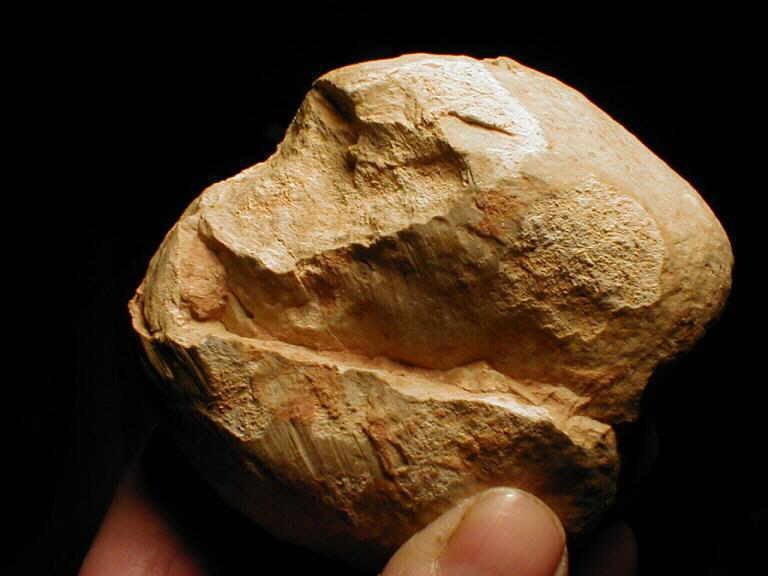 Similar high-pressure striae and clay polish have been described by E.C.T. 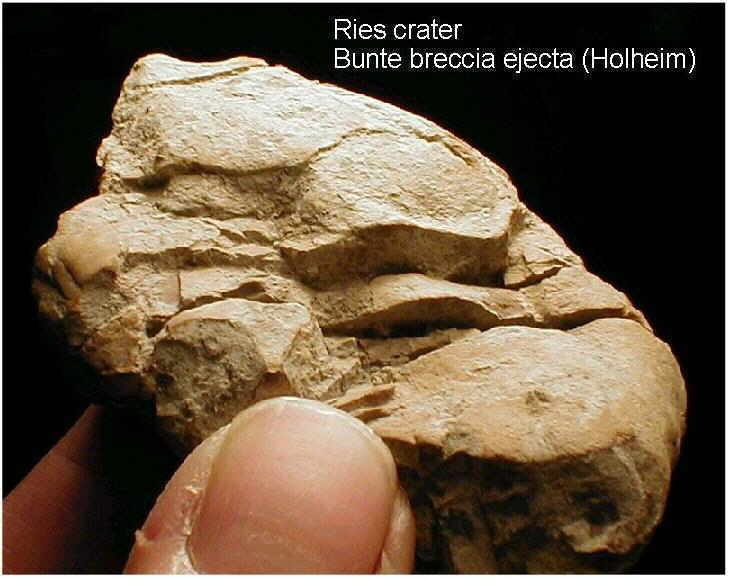 Chao (Science, 194, 615-618, 1976) for components of the Ries crater ejecta (Bunte breccia). 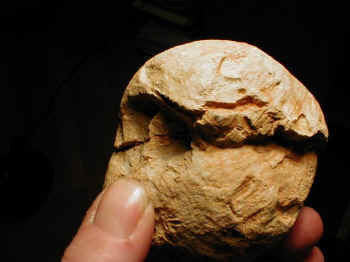 Also note the distinct groove (arrow) which formed before the polish. 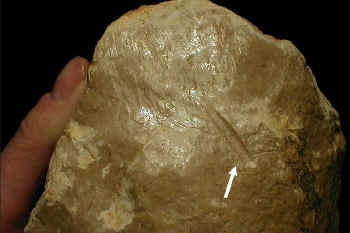 Puerto Mínguez impact ejecta: Limestone component showing two sets of striations (NE and ESE trending), penetration marks, and slightly rotated fractures (arrows). The large penetration mark reminds of butter and a knife having spread over it. 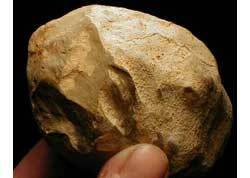 Puerto Mínguez impact ejecta: Limestone component with striae, grooves, and penetration marks in contact resulting in a faceted sculpture. 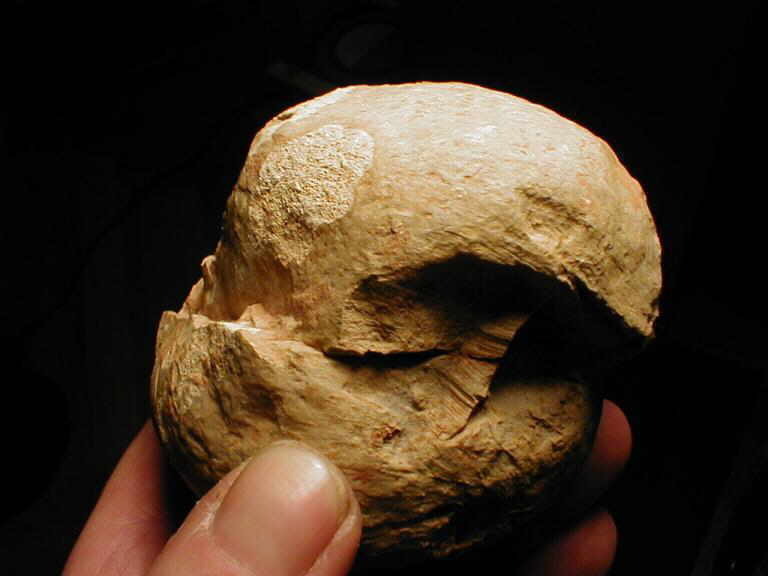 Right: Rear side of the component with similar deformations and additional mirror polish. 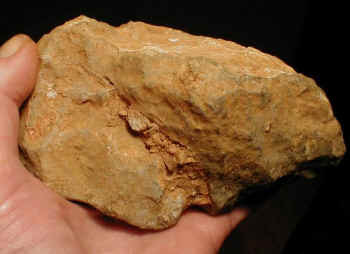 Puerto Mínguez ejecta: Strongly deformed limestone component with prominent displacements, however practically absent at the rear (see photograph to the right). The sharp-edged splinters of the fracture and the 1-cm deep imprint (arrow) point to both brittle and distinct plastic behavior of the sample upon deformation. Puerto Mínguez impact ejecta: Limestone component showing strong internal torsion. The distinct torsion relates to macroscopically untouched hinges and rotated fractures cutting through the whole cobble without breaking it to pieces. 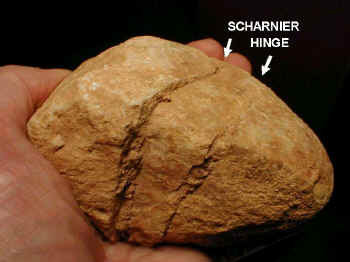 Right: Rear side of the cobble. 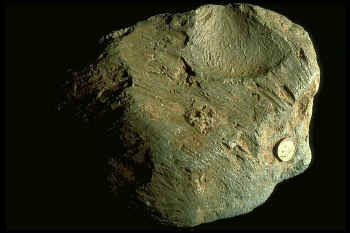 – These rotated fractures are very frequent in components of the Puerto Mínguez ejecta and are also observed in components of the Pelarda Fm. ejecta (see Ernstson & Claudín 1990). Very similar rotated fractures have been reported by E.C.T. 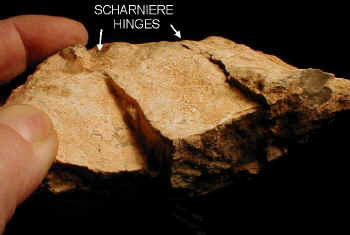 Chao (Geol. 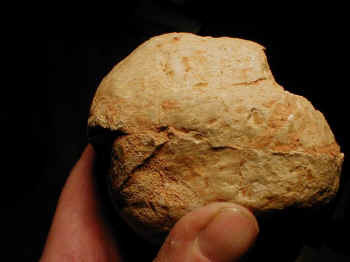 Jb., A 43, 1977) for the Ries crater ejecta (Bunte breccia) where correspondingly deformed limestone concretions occur within soft Jurassic claystones. The torsionally fractured components of the Pelarda Fm. 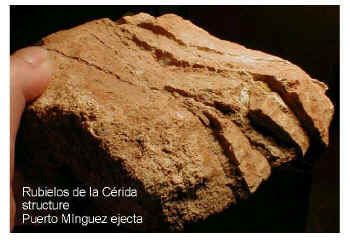 and Puerto Mínguez ejecta also occur in a soft matrix. Therefore, rotated fractures are considered typical of short-time impact deformation under high confining pressure. 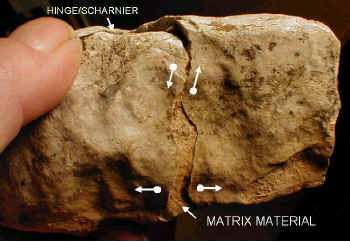 A quasi-static earlier tectonic deformation can be excluded, because many rotated fractures sharply cut striations which formed within the matrix and which have obviously preceded the fractures. 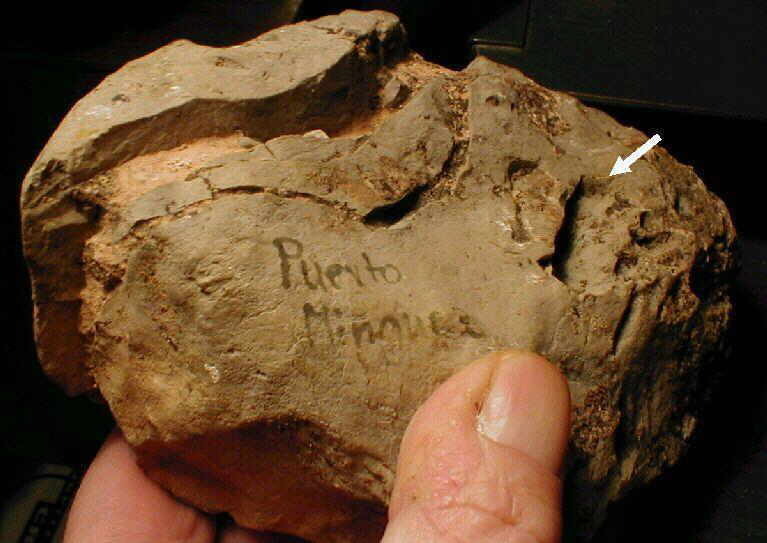 Puerto Mínguez impact ejecta: limestone component displaying rotated fractures and macroscopically untouched hinges. 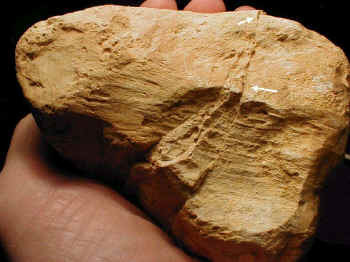 Puerto Mínguez impact ejecta: limestone component showing a rotated fracture from superposition of torsion and tension. The rear of the cobble is void of macroscopic displacements. 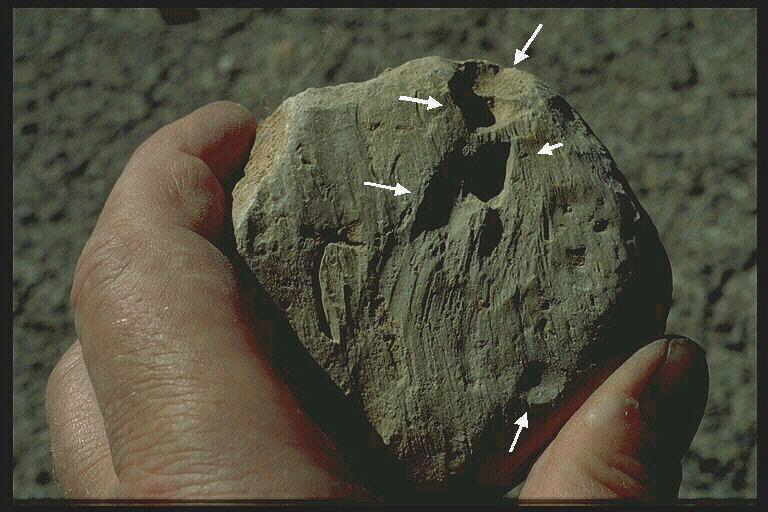 Puerto Mínguez impact ejecta: different views (follow from top left to bottom righ, and don’t forget to click on the pictures) of a heavily deformed limestone clast displaying rotated fractures, deep imprints, grooves, striations, and faint polish. 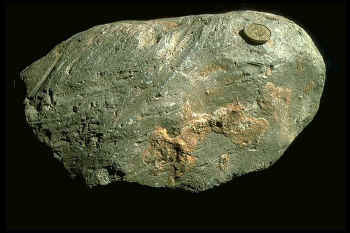 Puerto Mínguez impact ejecta: typical clast deformation (left), at first sight like a bread cut to slices. 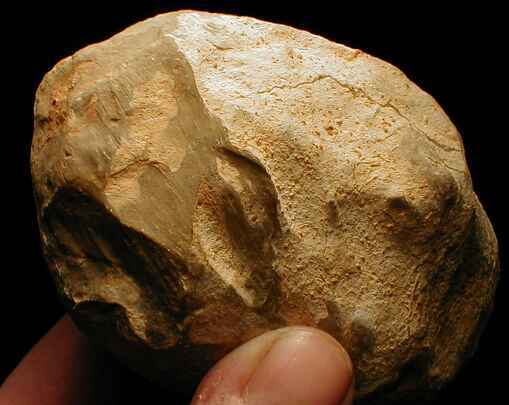 However, the clast ist not broken to pieces at all. Very similar deformations are well known from the Ries crater impact ejecta to occur in carbonate concretions (right) and in the famous so-called Ries belemnites both embedded within soft Jurassic claystones. Because of their soft embedding, the sliced Ries belemnite rostra were always considered in proof of short-time dynamic deformation, originally by a volcanic explosion, i.e. before the Ries crater had been established as an impact structure.